Prized for it’s distinct flavor and vibrant hue, saffron has been used throughout history as a cure for a variety of ailments and conditions, thanks to its antioxidant and anti-inflammatory properties. We love using it because we find its delicately floral taste to be delicious, and the color it imparts turns even the most ordinary dish into a special treat. In this recipe, we’ve added it to Ziba almonds along with complementary lemon and thyme. 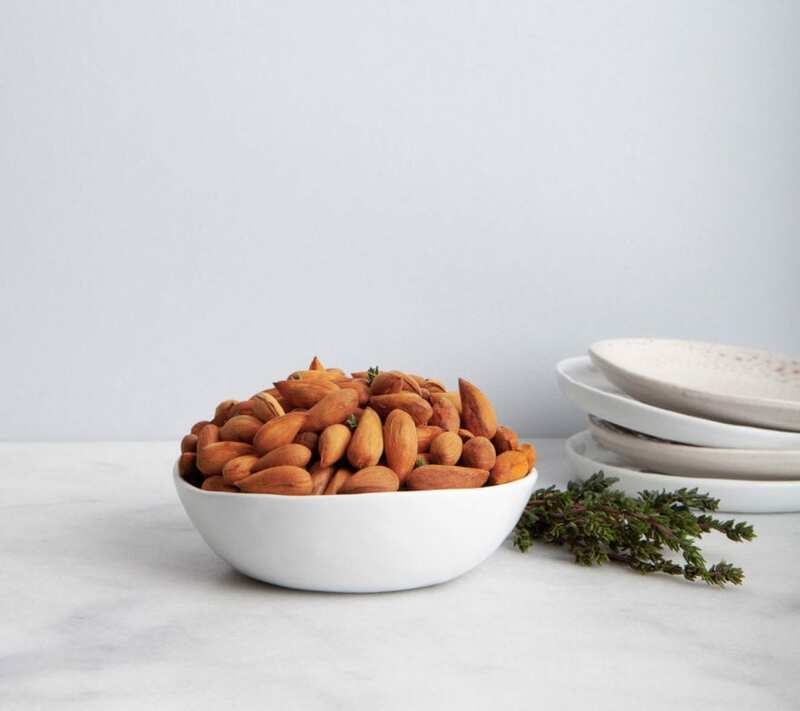 These almonds are great as a party snack or added to a grazing board or lunch box. Take the almonds and soak in the filtered water with the sea salt. Stir to dissolve the salt. Let the almonds soak for 2 – 4 hours (at most, for optimal roasting later). Drain the almonds from the water and pat dry. In the following order, add the lemon juice, steeped saffron water, olive oil, and thyme to the almonds, and stir well in between the addition of each ingredient. Let the almonds sit for a few minutes, then taste an almond and adjust for salt—an extra pinch or two might be more to your liking. Spoon the almonds onto the parchment-lined cookie sheet so they don’t overlap, taking care to not include any liquid left in the bowl. Roast the almonds in your preheated oven for 10 minutes. Take the almonds out of the oven, stir them, and return them to the oven for another 10 minutes. Remove the almonds from the oven and let cool on your kitchen counter. Store the almonds in an airtight container for up to a month.